“I have seen afresh the insanity of clericalism and of a deferential culture and how we have to struggle against that,” the Archbishop of Canterbury said yesterday in his evidence to the Independent Inquiry into Child Sexual Abuse (IICSA). Or perhaps one ought to say ‘Justin said…’, or, better still, ‘My mate Justin said…’, for this (archi)episcopal deference has gone too far. Other people have told us about both clericalism, excessive deference and God – we had a witness yesterday who said bishops are still seen and other clergy as Godlike because their power emanates from God rather than from Mammon. What do you do to ensure that there is no longer the abuse of power that we have seen parading through these doors over the past three weeks? It is an approach to ministry which leads to the abuse of power which makes him so deeply ashamed. The Archbishop of Canterbury is ashamed of the Church of England. That’s the story which is presently circling the earth (here, here, here, here, here and here…). 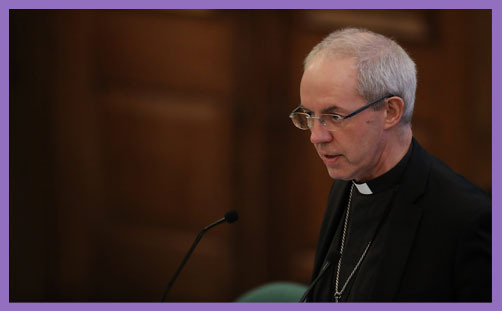 One must tread very carefully in saying it, lest one teeters toward committing the same error, but one raises an eyebrow at the revelation that Justin Welby has “learned to be ashamed of the Church of England”. Shame is our reaction to others becoming aware of our sin. The man who is having an affair may or may not feel guilty, but shame arrives when the affair becomes public knowledge; when suddenly he sees his own behaviour in the light of its public condemnation. Perhaps conscience or the Word of God should have aroused guilt enough to stop him erring, but when his peers condemn him, it is a rare man who will not be chastened. Occasionally one may properly feel shame as a result of the action of third parties. Parents or teachers should quite rightly be ashamed when public misbehaviour of their charges shows how badly they have reared them. A company director, whose mismanagement leads to bankruptcy, or perhaps a husband whose example has led his wife to be caught drinking and driving may properly feel shame about their failure being revealed by the behaviour of another. But more usually shame has no godly purpose when it is applied to the behaviour of third parties. Take, for instance, when Matthew Parris declared that he felt “ashamed to be British” after the EU Referendum. It may have been that he felt guilty because he, along with other Europhiles, had not encouraged the EU sufficiently to reform in the light of fair criticism. He might even have felt guilty for failing in some way to get across the benefits of the EU gospel of redemption by resolution. More likely, Matthew Parris was experiencing rage, indignation and frustration at being thwarted, quite a long way from shame. And, too, he was voicing condemnation of those who had voted Leave, an overt declaration that his way of voting would have been better. So when we hear about the Archbishop of Canterbury – our mate Justin – learning to be ashamed of the Church of England, what do we hear in that? Is this the cry of a man who realises more and more the depth of sin – his own as much as that of others – and how every institution, even one formed for the curing of souls, will always fall so far short of God’s glory? Do we hear from him the call of Isaiah: ‘Woe is me! for I am undone; because I am a man of unclean lips, and I dwell in the midst of a people of unclean lips‘? Or do we hear a man proclaiming ‘Now we know better..’, or ‘Now that we have learned lessons..’, perhaps even ‘Now that I am in charge..’ things will be better? Like the European Union – and, indeed, like (Christian) socialism in general – does Justin Welby believe in the perfectibility of institutions through the saving grace of systems? Does not the EU propagate its own secular clericalism with its ‘I am God’s gift to the Continent’ approach to life? As Charles Moore once observed, the EU’s inexorable drive to ever-closer union “is being conducted like a papal conclave”. In this, he echoed the late Lord Shore of Stepney, who observed in his book Separate Ways that the EU Commission behaves “like a priestly caste – similar to what it must have been in pre-Reformation days, when the Bible was in Latin, not English; the Pope, his cardinals and bishops decided the content of canon law and the message came down to the laymen, only when the Latin text was translated into the vernacular by the dutiful parish priest”. How can you abhor deference and clericalism in God’s holy institution, but laud it in the temples of man? Is the gospel which Justin preaches the one in which sin will decrease if we only can get the rules right; if only we can get the institutions right; if only we can abolish deference and clericalism both sacred and secular? Or do we have an Archbishop who knows fully that ‘The heart is deceitful above all things, and desperately wicked‘? For only the man who knows the depth of his own sin can know the magnitude of the problem, and that this world will ever be bedevilled by sin. Only then can he teach the cosmic nature of Christ’s sacrifice, which is the only solution to clericalism and deference, and, indeed, to all our despair.